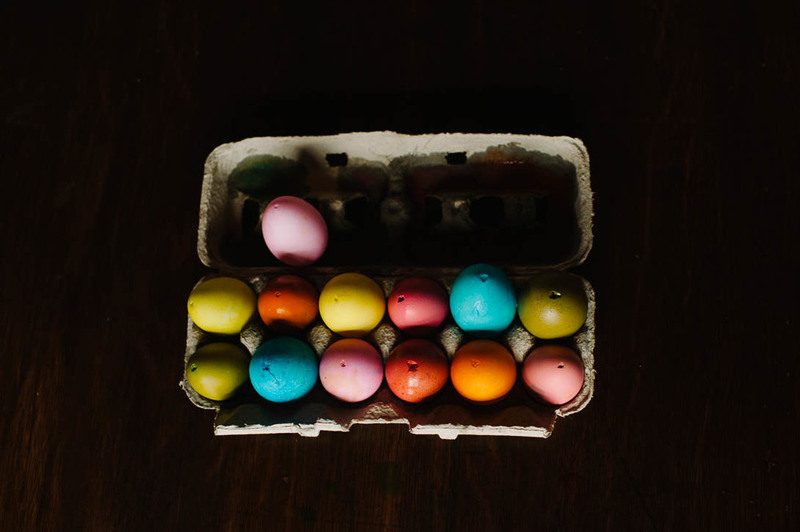 When it comes to Easter egg dying, we keep it pretty simple around here, but are always thoroughly satisfied with our results. This year, just like last year, we used a box of dye from the grocery store & mixed it with a little bit more vinegar than suggested, & water. The eggs, once again, came out so vibrant. We dyed a combination of duck & chicken eggs. The results of the chicken eggs were always exciting, as their different shades of brown mixed with the bright hues. I blow the eggs before dying, so we can hang them on a branch of pussywillows. It makes for a beautiful, bright spring centerpiece. When Ry's chicken egg allergy was more severe, we would dye wooden eggs, which was also very fun! The other day, when browsing the Easter aisle at the grocery store, I noticed they now sell white plastic eggs that can be dyed, as well as chalkboard eggs. Two other options that could be a lot of fun for those who can't touch chicken eggs. It's always an adventure!